It’s festival time in the town that Konohanatei is in (I wonder if we’ll ever get a name for that town? ), and several of our girls are eager to to see it. Given what we know of Yuzu’s past, it comes as no surprise that she’s never seen a festival before, but it’s a bit surprising to learn that Sakura has also never been to one. I suppose we really don’t know anything about her past, but I suppose I had just assumed she’s been at Konohanatei long enough to have gone to one the previous year. Apparently not. 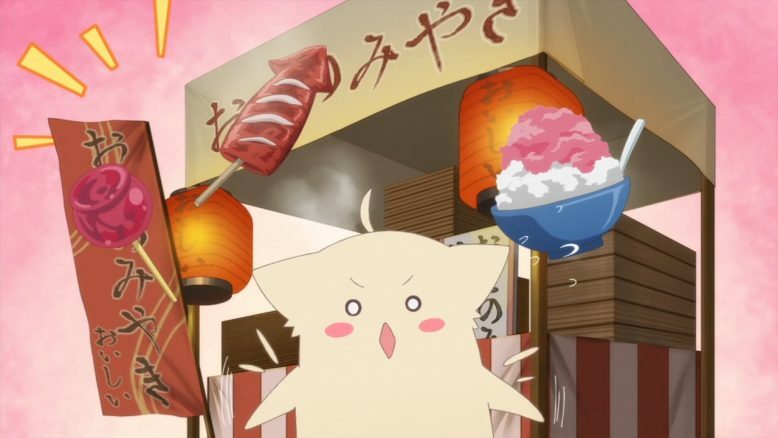 Anyway, Kiri declares that, as long as they go in shifts so that a couple people remain on hand to handle work, it’s fine for the girls to attend the festival. Satsuki, asocial as ever, tries to weasel out of going, but Kiri ropes her into being Yuzu and Sakura’s chaperone with the (entirely accurate) point that it would be very bad to send those two out there without someone more responsible looking after them. Ren, of course, is easily talked into going by Natsume insisting it wouldn’t be fun without her there. The only ones who don’t go at all are Kiri, Okami, and Okiku. The former two refrain, ostensibly, because they’re older and it’s better for young people to enjoy festivals while their elders work… although Kiri pointedly ignores questions of just how old she is. Okiku, on the other hand, has to stay for a different reason… I’ll get to that in a bit. Satsuki, Yuzu, and Sakura head to the festival first, and we see right away why the kids needed Satsuki along. Not that Yuzu doesn’t try to be responsible, but her tendency to say and act excatly the way she feels works against here here, because how she feels is amazed at all these wondrous things she’s never seen before. Fortunately, Satsuki is keeping a better on eye Yuzu and Sakura than Yuzu is on either of them, and quickly corrals the errant children back into line. Not without some embarrassment of her own at having to walk holding hands with them, but at least she puts up with it like a good chaperone. Or a moderately good one, anyway. 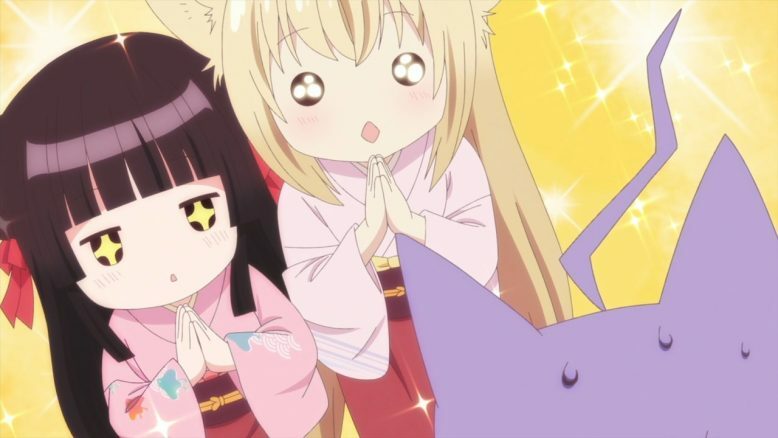 Of course, this wouldn’t be Konohana Kitan without the supernatural interjecting itself into things, and this time it comes to us through the bon dance at the festival. Apparently spirits of the dead are given this chance to visit the world of the living before going back to the next world, and in this town things like that can be more than merely symbolic. 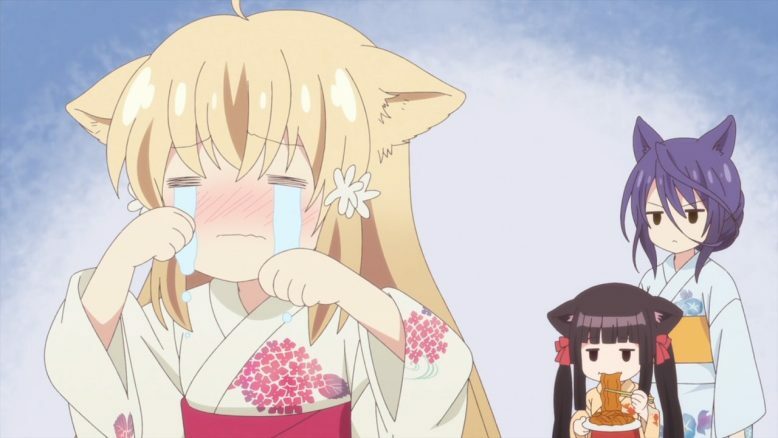 With a quick flash to Konohanatei, we learn that this is why Okiku wasn’t allowed to attend the festival this year: apparently, being a newcomer, she’s in danger of being taken away to the other side. A shame no one thought to consider the possibility that the same be true of Yuzu, especially after her previous ghostly encounter. Joining in the dance, after a while she somehow finds herself in the line of spirits heading for the afterlife. 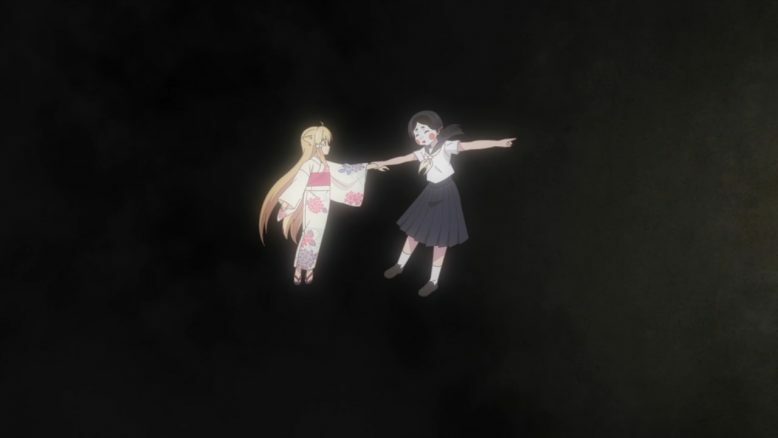 It’s only thanks to the intervention of the ghost girl who she helped in the previous episode that Yuzu is able to return safely to the world of the living. That’s twice in as many episodes that Yuzu has nearly passed over. Someone really should keep a closer eye on her. In the second half of the episode, Ren and Natsume’s festival time really just goes pretty much the way one would expect. Ren dresses up nice in new clothes and new sandals to try to appeal to Natsume, who seemingly doesn’t notice at all and instead just rushes around playing the festival games and eating the festival food without a care for the beautiful girl who just wants to spend time with her. Of course, as we discover Natsume actually does notice all the new things about Ren, as well as Ren’s increasing dissatisfaction as the night goes on. Personally I think that, since she does this same pattern every year, it wouldn’t have hurt her to try to find a way for both of them to enjoy the festival, rather than just Natsume dragging Ren around to things only Natsume enjoys. Of course, some fault does lie with Ren for insisting that she’s fine rather than actually vocalizing her feelings. Of course, as almost always happens to someone at these festival episodes, Ren ends up injuring her foot on her new sandals. Now, it’s true that any footwear is likely to injure your feet if you wear it for extensive walking without breaking it in first, but these sorts of sandals in particular seem especially brutal. I don’t care what tradition is, they need to invest in something that has a strap that goes back around the heel, and which fits properly so it doesn’t rub when you walk. Looking at the marks left on Ren’s foot makes me wince in pain. That’s going to really hurt once she starts feeling it. I wouldn’t want to try putting socks on over that: ouch. 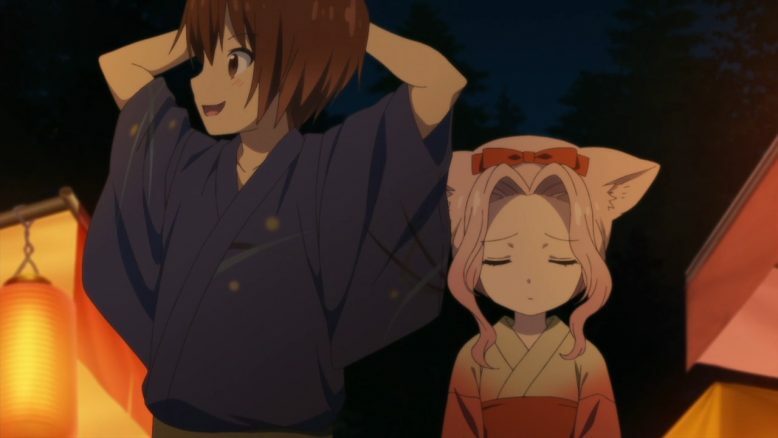 Still, Natsume shows her awareness, having noticed the new clothes and sandals, and properly concluded that Ren was hurting herself by wearing the things. 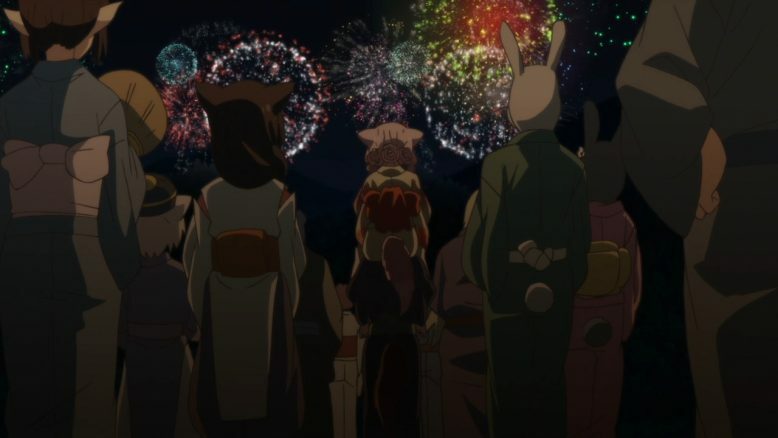 And she even gives Ren a seat on her shoulders to see the fireworks, which really are spectacular. 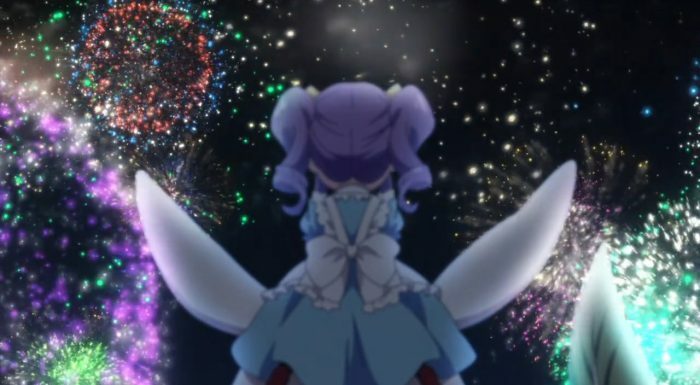 Probably one of the best depictions of fireworks I’ve seen in anime, really. Finally, as Natsume carries Ren home (before Ren convinces her to let her walk barefoot), Ren finally remembers that this too happened last year. Natsume’s seeming insensitivity in charging off to play games at the festival doesn’t prevent her from noticing the important things, and she means it when she says it would be no fun without Ren there. If Ren wants to leave, Natsume will leave as well. Despite their issues, the two of them truly are a close couple. This episode feels fairly simple, in a slice-of-life sort of sense. Despite Yuzu’s little adventure, for the most part this was just a fluffy episode about the girls going out and having fun at a festival. Which is perfectly fine, as far as I’m concerned. Cute girls doing cute things is what I watch for. Still I feel a bit bad for Okiku, being stuck at the inn. Of course, the real reason for that is because her character hadn’t been introduced originally when these chapters were published, so inserting her into festival antics would have taken much more effort than just writing a few distinct original scenes with her back at Konohanatei. Still, she seems to get the raw end of the deal fairly often, and it would be nice to see something good go her way. In other news we’re on to the third ED: this one set to the theme of Fall. Seems a bit odd to switch to that on an episode that focuses on one of the big summer festivals, but there you go. Can’t say I like it quite as much as the energetic summer ED, but it still sounds nice. Regardless, I’m looking forward to more. Yes, apparently these two are a thing. They’re just much less obvious about it than some other folks around that inn.